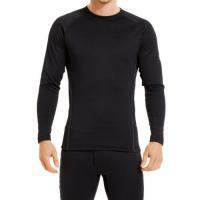 Stay warm, active and alert while wearing Under Armour's Men's UA Base™ 3.0 Crew. Engineered to handle extreme environments and activity, the UA Base™ 3.0 offers the highest level of cold weather protection available. A fitted design allows this thermal crew to sit close to the body without uncomfortable compression, making it ideal for base layer wear. A unique negative grid interior seals in hot air for maximum body heat retention. UA's signature moisture transport system wicks away chilling sweat, providing a final component for all-day, ultra-warm comfort. Designed for active wear, the four-way stretch fabrication and flatlock stitching offer a free-range of motion and unrestricted mobility without discomfort from chafing.